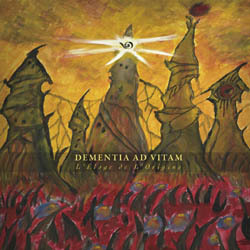 French dark folk, neoclassical band Dementia Ad Vitam will soon release its third full-length album, entitled “L’Éloge de l’Origine“. According to the band, the new work will be quite different from its first 2 releases, “Spirit of the Trees” in 2008 via Occultum Productions and “De Gaïa, le Poison…” in 2010 via Naturmacht Productions. “L’Éloge de l’Origine“ will be released in April 30th 2014 via Owltree, the new sub-label of Chinese Pest Productions, which will be dedicated to phenomenal, melancholic and beautiful dark folk, forest folk and ritual folk music. ”L’Éloge de l’Origine” will come out in a limited to 300 copies 6-panel digisleeve CD, including a 12-page booklet with paintings by Chaim Drishner! It is already available for listening in their label’s official Bandcamp page that you can check in the links below. I’ve got their album De Gaïa, le Poison…, purchased from Naturmacht (great label!). I hope this one will be as good. Quality music !